Important: Hair loss is treatable using homeopathy. Baldness is not curable. 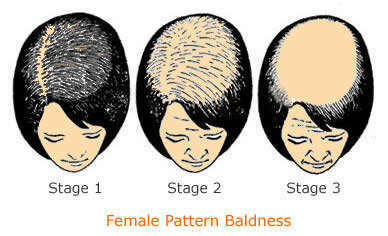 Male and female pattern baldness is a result of the combination of aging, hormones (androgens/testosterone) and heredity (genetics). Men and women tend to lose hair thickness and amount as they age. Inherited or "pattern baldness" affects many more men than women. About 25% of men begin to bald by the time they are 30 years old, and about two-thirds are either bald or have a balding pattern by age 60. In addition to genes, male-pattern baldness seems to require the presence of the male hormone testosterone. Men who do not produce testosterone (because of genetic abnormalities or castration) do not develop this pattern of baldness. The rate of hair shedding in androgenic alopecia is speeded up by three forces: advancing age, an inherited tendency to bald early, and a genetically inherited sensitivity to Dihydrotestosterone (DHT) and 5-alpha-reductase. The enzyme 5-alpha-reductase converts testosterone, a male hormone, to DHT, the substance identified as the end-cause for hair loss. Over time, the action of DHT causes the hair follicle to degrade and shortens the anagen phase. With a steadily shorter anagen (growing) cycle, more hair strands are shed, the hair becoming thinner and thinner until they are too fine to survive daily wear and tear. Balding hair gradually changes from long, thick, coarse, pigmented hair into fine, unpigmented vellus sprouts. Research also indicates an immunological factor in balding. Basically, the immune system begins to target the hair follicles in the hair loss area. Typical male pattern baldness involves a receding hairline and thinning around the crown with eventual bald spots. Ultimately, you may have only a horseshoe ring of hair around the sides. hair with no visible hair loss. hairline has receded deeper into the frontal area and the temporal area. that has receded more dramatically in the frontal region and temporal area. Additionally, there is a balding area at the very top center of the head, but there is a bridge of hair remaining between that region and the front. on the Norwood Scale shows that very same bridge between the frontal region and the top center, also called the vertex, beginning to thin. on the Norwood Scale indicates that the bridge between the frontal region and the vertex has disappeared. on the Norwood Scale shows hair receding all the way back to the base of the head and the sides just above the ears. Norwood patterns are determined genetically. Note: We, at Life Force, treat cases of Hair loss and Alopecia Areata. We do not treat cases of Baldness or Male-Female Pattern Baldness. It may be noted that many patients get confused and misguided as they may not know the difference between Hair loss / Alopecia Areata and Male Pattern Baldness.